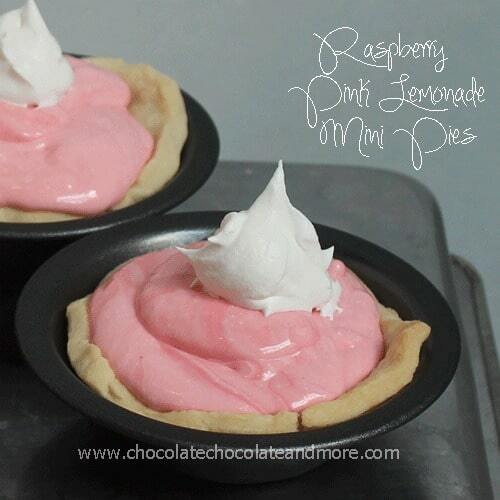 Mini Raspberry Pink Lemonade Pie and #helpwhipcancer - Chocolate Chocolate and More! 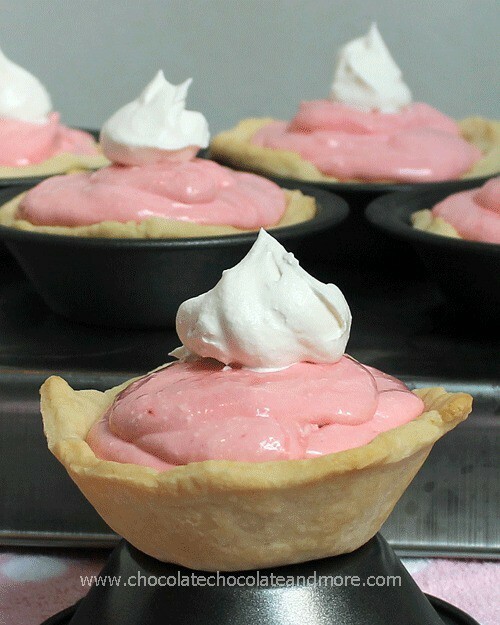 Mini Raspberry Pink Lemonade Pie-the great lemony flavor you love with a hint of raspberry, the perfect cool dessert for a warm summer day! For the past year, I’ve been working hard on improving my photography and my “food styling.” I want pretty pictures. 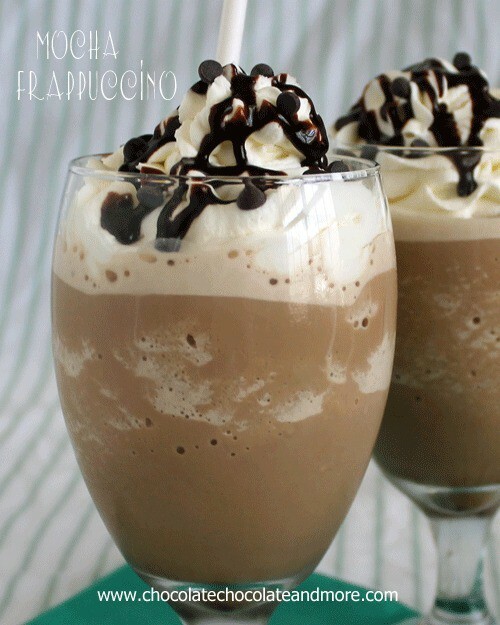 Let’s face it, if the picture looks good, drool worthy, you’re more likely to want to try it. Or maybe you’re not as shallow and superficial as I am. I admit it, I do judge food on the internet by it’s photo. I have no misconceptions of being magazine quality. And I’ve given up on the big Food Photo Sites. They are just too judgy- too light, composition, too close, too far. Maybe if I adjust something by one millidegree (wow, that really is a word!) then they’ll like it? That’s not why I get in the kitchen and create. I bake and create in the kitchen because I love to do it. Let me tell you, this pie is easy to make, something the kids can help with, perfect for a summer BBQ. And it’s a pretty pink color. 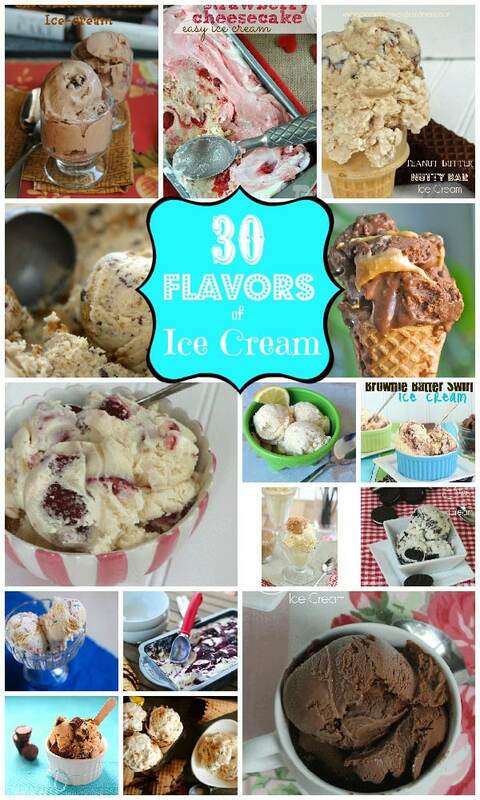 Oh, and it will definitely satisfy your sweet tooth. But my photos. To me, they were off. I was getting a reflection, then a shine. And I noticed a streak. then a tiny lump. And then I remembered why I was writing this post. I was writing it for my amazing Mother-n-Law, and her sister…and her brother. All of who passed away from Cancer. 3 out of 4 siblings, all taken from us by this horrible disease. I was writing it for my husband, and my children, who based on the probability of genetics…I don’t even want to think about the odds. It didn’t matter anymore that my photos weren’t perfect. It mattered that Pampered Chef is trying to make a difference with their Help Whip Cancer Program. Since 2000, Pampered Chef has raised over $10 million for Cancer research, One dollar at a time. To me, that’s amazing. A few Pie crust tips. Make sure your butter is cold. Take your time blending it into your flour mixture, it only takes a few minutes. Add your water a little at a time. You don’t want your dough to get pasty. I prefer to roughly trim my crust before placing it in my pie dish. Just invert the dish over the crust and leave a little extra edge. 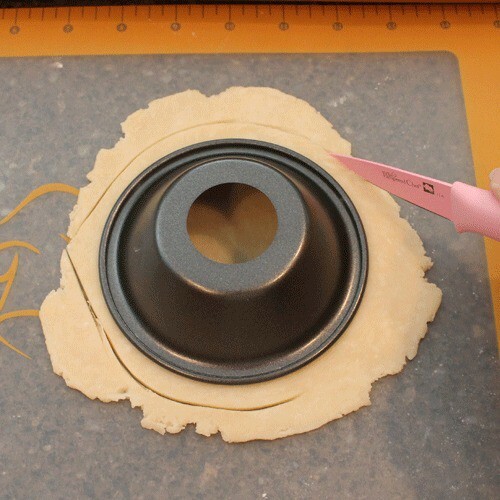 When blind baking (baking without filling) either use pie weights or just use a fork and poke lots of holes, otherwise the crust will get air pockets. 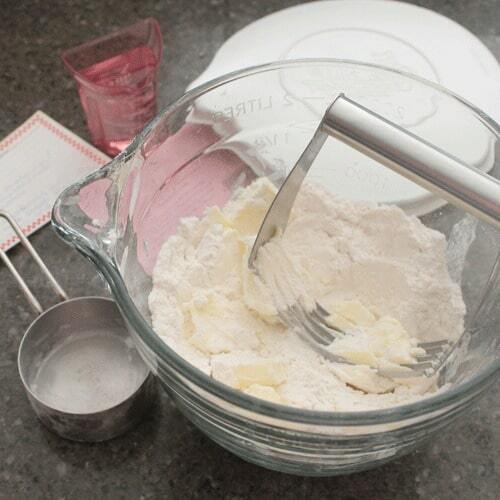 Using a pastry blender, blend together flour, salt sugar and butter until crumbly. Slowly add in water until dough forms. Divide dough into two balls and wrap in plastic wrap. Place on refrigerator for at least 30 minutes. When ready to bake, remove dough from fridge and divide into 6. Roll each dough ball out to about 3/8 thickness. 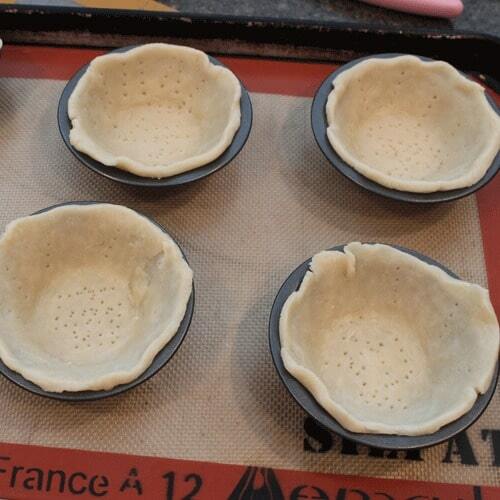 Using your mini pie pan, cut crust to be about 1/2 inch wider than your inverted pie pan. gently press crust into pie pan, repeat with remaining dough. Using a fork, make several holes in your dough to prevent air bubbles under the crust. Bake in a preheated 375 degree oven for 15-18 minutes. Let crust cool completely. Cream cream cheese till smooth. add in sweetened milk and lemonade, beat until well combined. add in food coloring, keeping in mind color will lighten a bit. Fold in whipped topping. Spoon filling into prepared pie crusts. Freeze for 3-4 hours to set. Wonderful cause Joan! I think your pie is drool worthy! Having a cousin who died of a Brain tumor, and coming from a family where cancer is in both sides, I love this cause. And I love Pampered Chef, so this is a win-win! (Also that pink paring knife is adorable. Do want.) I love an all butter crust, and I loved reading these pie crust tips. My favorite family dessert is my apple pie! That’s what got me into baking and my whole family loves my pies. Pampered Chef does so much good. I have been a consultant for about 10 years (mostly selling to myself and my 6 kids). I do love Pampered Chef, their products are top quality. Your pies are perfect, great post. Thanks Cindy, I’ve been a fan of PC for about 20 years now. I think these are very pretty! And what a candid and sweet post! Hope you have a lovely mother’s day, you seem like a great mom! Our favorite family dessert is a whip cream fruit salad…passed down three generations now and hopefully to four soon! 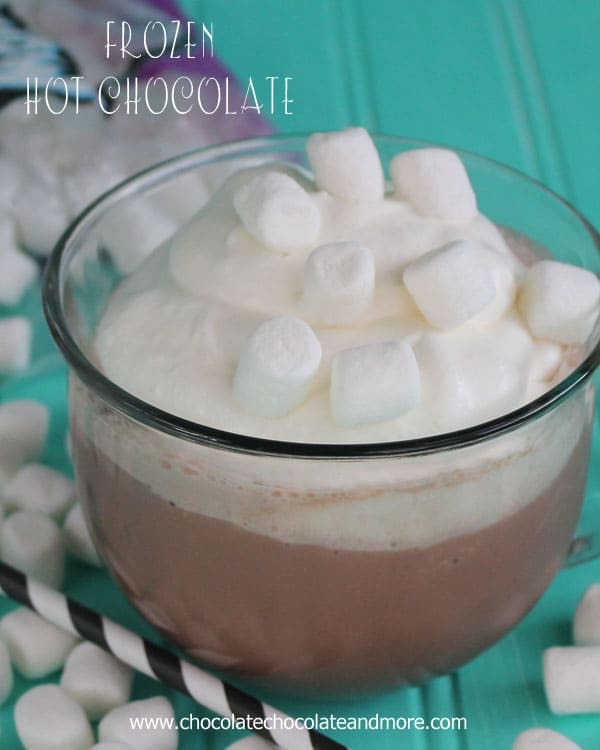 Made with homemade whipped cream too. A family gathering is not complete without this family favorite dish! My favorite family dessert is homemade strawberry rhubarb pie. It is a sign of spring turning to summer. Love the PINK! THEY LOOK SO PRETTY! That looks terrific. I cannot wait to make this one. You make it look so easy. If we only could whip it away!! 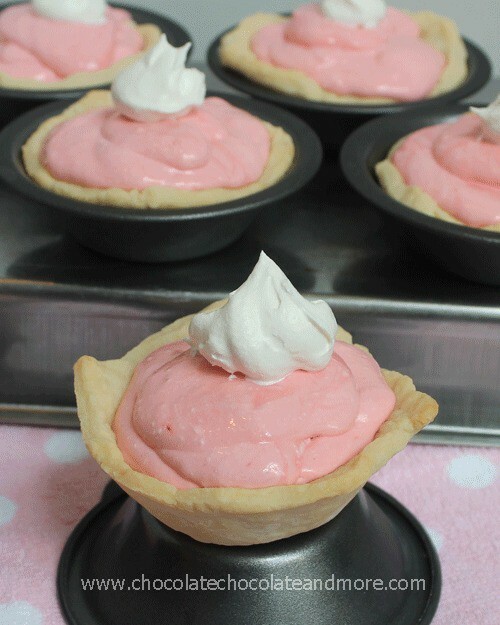 These mini pies look amazing, pinning!! I know what you mean about the photos. Half the time I don’t post something b/c it’s not perfect enough (and I haven’t submitted to a photo site in ages). This is too sweet not to share and for such a personal reason-we’ve all been touched by cancer, unfortunately. Those just scream summer!! And they’re so pretty and pink, too!! 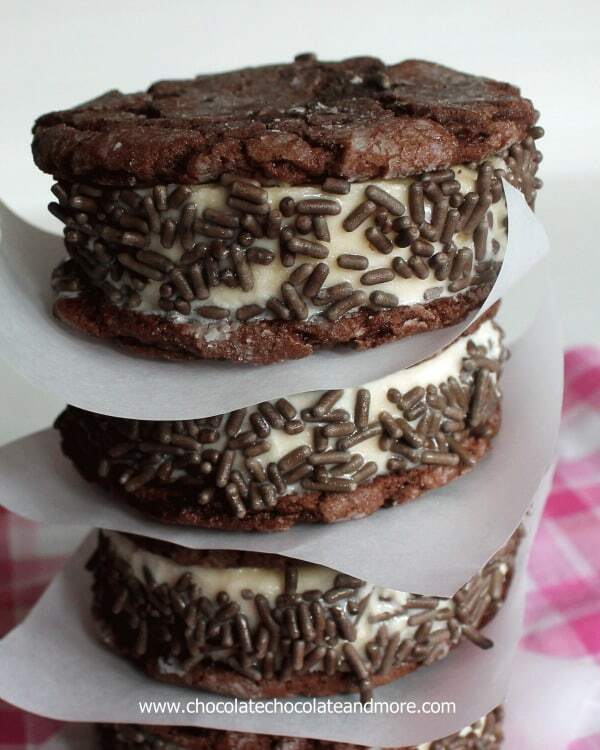 Everyone thinks I’m crazy because I’m not a chocoholic, so when I see a dessert like this, I’m bookmarking it as fast as I can. I’m absolutely sure that it tastes every bit as good as it looks. Thanks Laurie! If I can’t have chocolate Lemon is always a great back up! What cute little pies! The great news is that you are helping awareness for such a tragic disease that affects so many. Great job! our favorite family dessert by far is what I call “4-layer delight”. my husbands mom calls it “Chocolate goodie”. No matter what you call it, its good! My favorite family dessert is buckeyes!!! Sweet coconut rice and mangos! Fudge cakes–my grandma’s version of brownies! Love your recipe! What a great way to honor the women in your life! i love pink & to have pink utensils for my kitchen is a bonus!! Your little pies are so cutsie…and for such a great cause. How tragic to know of siblings all who were taken by this horrific disease. Thanks for willing to take the lead in this campaign. Our family favorite dessert is ice cream pies. They are frozen so can be made ahead and that’s great too. 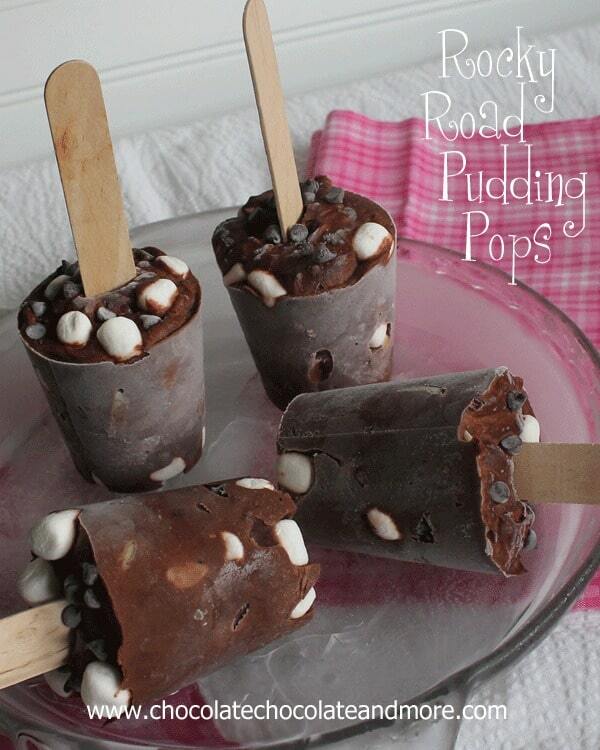 These look so yummy and refreshing for summer! I’m featuring this on Terrific Tuesdays. I have a question: Is it 1/4 cup of lemonade concentrate or of prepared lemonade? 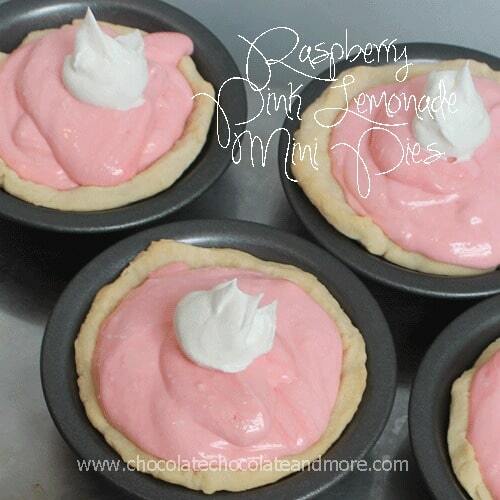 Can’t wait to make these, will add a fresh raspberry on top. Hi Cindy, it’s 1/4 cup of the concentrate. Your photos were wonderful. It made me want to make these. Imperfections or not they looked beautiful to me-just as you must be a beautiful person for your dedication to this cause. God bless you! !